The good news is that Mum has finished her first batch of miniatures to paint and truth be told, she's pretty good. I taught her to basecoat, drybrush on highlights, paint details and apply washes -all the basic techniques you'll need to make a good looking army quickly and easily. All she needs is some practice and I reckon she could churn these models out at a decent rate. To break her into painting models, I thought something big and chunky would be a good start. So I cobbled together a squad of terminators from my bitz box and Black Reach. To make the colourscheme interesting, but not too challenging, I thought that Crimson Fist termiantors would be a good start. nice, dark basecoat, a bright red fist to contrast and then all the usual details. 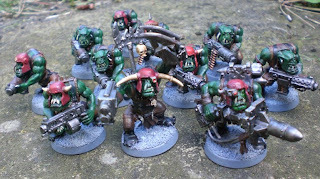 Once she'd painted the terminators to a good standard, I bought her a box of Orks to try out. Very different to the terminators and very detailed. Ork colour schemes seem to be getting very complex again, so I went with the Evil Sunz scheme from Dawn of War. This is basically brown clothes, black boots, black belts and red armour. The colourscheme is simple, but it works very well. Although it took her a while to get used to spotting all the tiny detail like earings, lip piercings and fingerless gloves. Sometimes I think my family's endeavours are cursed. Because on the very day that Mum put down her paintbrush and raised her arms in victory over the Orkish horde (of 11 blokes), it has been leaked that Games Workshop will be releasing pre-painted models much like At-43 to stand alongside their DIY miniatures in the coming months. Obviously, this throws any notion of a model painting business into limbo when (as At-43 has proven) it's cheaper and more time effective to purchase prepainted miniatures. There are 2 types of people in this hobby -those that paint their models and those that don't. That's a sweeping generalisation and encompasses many different types of gamer from the guy who enjoys the game, but can't paint, to the guy (like myself) who loves to paint, but can't find the time. And I have to confess, that no matter how much I may love my Tau army, love the presence they have when they cruise on to the board and how I've truly made them mine with Battlesuit conversions and orange stripes, I would gladly pay for prepainted miniatures painted to At-43 standard. Wait, it's been reliably leaked that GW will crank out pre-painted crap? I mean, don't get me wrong, I've seen some decent pre-painted stuff. On the other hand, I kind of enjoyed painting and basing my own stuff. I'd rather not have to strip the stuff I buy in order to have cohesive armies. Seriously, does anyone WANT to try to sort out stocking all that, or is it just easier to stock ONE tactical box? On the other hand, if it keeps the hobby alive...eh. That's something, I suppose. Where was the leak that GW are going to release pre-painted models? That one seems to have got past me! Prepainted models? Where did you pick that up? Pre-painted minis? Where's "the hobby" in that? If there's one thing GW has always ALWAYS said is that they don't make games. They make miniatures. They are a hobby company, not a gaming company. Their quality of their rules and quality of support for their rules are proof enough of that ridiculous statement. So where did you hear this rumour? I can't find any support for it anywhere. Doing this would be a crass move on their part, and is bound to failure unless they drastically improve their rules, FAQs, and rules support.